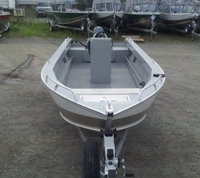 We've perpared you for success on the Open Fisherman, thanks to our ‘form follows function’ mentality. Whether you’re navigating from your seat with a tiller handle or standing at a center console, every element is carefully positioned to provide optimum balance for driver and crew. Better still, our delta pad bottom option provides the best performance for an outboard jet to navigate rivers. Trust us, the fish have nowhere to hide. 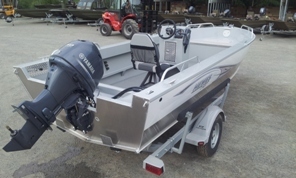 The Open Fisherman my look simple but this boat’s functionality has been thoroughly designed. Your crew will love fighting the big fish on its maximized deck space, and passengers will keep their balance thanks to its bow-mounted fuel tank. Plus, you won’t have to worry about storage. 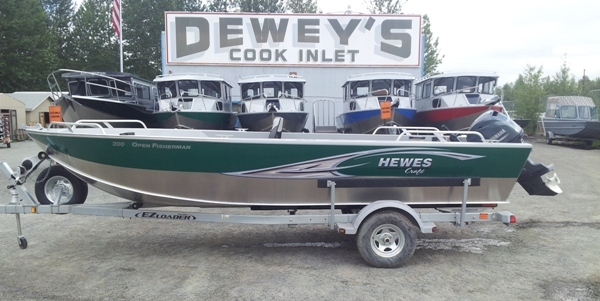 This workhorse features a best-in-class, in-floor fish box that’s nearly four feet long. And since it’s removable, you can keep your bilge cleaner too. 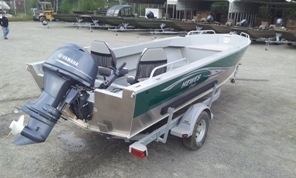 So whether you’re a guide or a weekend sportsman, the Open Fisherman will deliver years of great fishing trips. 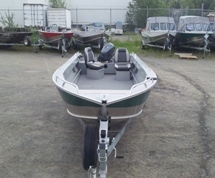 20' Open Fisherman Yamaha F50 4-Stroke Spec. EZ Loader Trailer Spec. Beam 86" 60.8CI Weight 530 lbs.